Reliable sources say that Minister of Home Affairs, Hon. V. H. Courtenay, was unable to travel to Japan in connection with the establishment of a Belize office there because his physician has ordered him confined to bed for two weeks. Mr. Courtenay has been attacked by a mysterious virus for the past few years. My column last weekend, after spending a few weeks discussing the Hon. Philip Goldson and the Thirteen/Seventeen Proposals, drifted into the Southside City politics of the People’s United Party (PUP), with a focus on their Mesopotamia area representative, C. L. B. Rogers. Mr. Rogers, who won the Mesop constituency in the 1961, 1965, 1969 and 1974 general elections, became PUP Deputy Leader and Deputy Premier in the latter part of the 1960s. 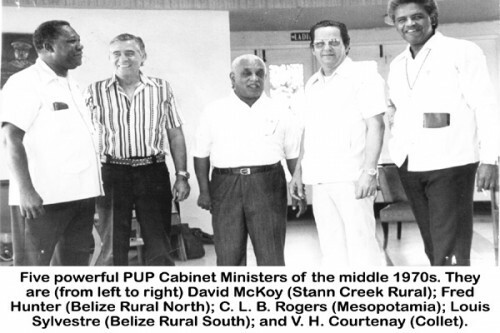 Perhaps the first real inkling that the PUP was having Southside credibility problems, came in the 1979 general elections, when the PUP won 13 out of 18 seats nationwide, but lost two of the three Southside Belize City seats – Albert and Mesopotamia. After winning all three Southside City seats in the 1961 general election, the PUP won two out of three Southside seats in each of the three general elections between 1965 and 1974. But the PUP margins in the Collet constituency were always very close, whereas the NIP’s Philip Goldson was winning Albert by healthy margins, so that insofar as the total Southside vote was concerned, the NIP (NIPDM in 1969 and UDP in 1974) was polling more votes than the PUP, beginning in 1965. Then, in 1984 the PUP lost all six of the Southside City seats, the Southside seats having been increased from three to six, and the overall House seats from 18 to 28. 1984 began a pattern which has remained true until today. When the PUP loses all six Southside Belize City seats, as they did in 1984, 1993, and 2012, they lose general elections. When they win at least two of the Southside seats, as they did in 1989 (Lake Independence and Collet), 1998 (Lake Independence, Albert, Port Loyola, and Collet), and 2003 (Lake Independence and Albert), the PUP win general elections. The only general election since 1984 the PUP have won two Southside seats and lost the generals, was in 2008 (Lake Independence and Albert). When the PUP lost two of the three 1979 Southside seats, Deputy Premier Rogers’ defeat in Mesop was the big Southside story. In last weekend’s column, I did not include an important fact. I said that Mr. Rogers and the senior Courtenay, House Speaker Woolrich Harrison, did not care for each other, and I suggested that the 1969 Collet constituency candidacy of W. H.’s son, Vernon Harrison, would have increased Mr. Rogers’ discomfort. In the 1974 general election, V. H. Courtenay had defeated the UDP’s Ken Tillett by a single vote. When Mr. Courtenay increased his margin of victory over Tillett to 224 in the 1979 general election, PUP insiders felt that Courtenay’s 1979 margin over Tillett was almost identical to the amount of votes Mr. Rogers had lost to the UDP’s Curl Thompson between 1974 and 1979 (214) and to the number of Mesopotamia voters who had moved to the new St. Martin De Porres housing development in Collet. The voters who moved from Mesop to Collet between 1974 and 1979 moved from inferior housing conditions, such as the George Street Long Barracks, so there was the belief inside the PUP that Mr. Rogers had made a sacrifice which hurt himself and benefited Mr. Courtenay. The question then was: why would he? The fact that Mr. Rogers retained his Home Affairs Cabinet portfolio and remained Deputy Premier in the 1979 PUP Cabinet, was seen as confirmation of the speculation by PUP insiders to the effect that Lindy’s Mesop had been sacrificed for Harry’s Collet, that some kind of deal must have been cut. In Belizean Cabinet politics, however, if you sit in there and you don’t do so as the elected representative of a constituency, you become an endangered species when there is crisis. The ruling PUP went into crisis in December of 1983 when the Opposition United Democratic Party (UDP), under the new leadership of Manuel Esquivel (Esquivel was chosen to lead the UDP and replace Dr. Ted Aranda in January of 1983), won a landslide victory in the Belize City Council election. With a general election due by December of 1984 and the PUP showing signs of a Southside malaise, Mr. Rogers became the sacrifice. He was removed from Cabinet in early January of 1984 and quickly began to fade from the PUP limelight. Mr. Rogers was replaced in the powerful, important Home Affairs portfolio (which is now called National Security) by V. H. Courtenay, but within a few months Mr. Courtenay became seriously ill. He did not even defend his Collet House seat in the 1984 general election. Sometime in 1978, Deputy Premier Rogers himself had experienced a major health crisis. There was not much of a Belizean media in those days, so the PUP was able to keep the situation completely hush-hush. My impression was that he had actually been flown to a foreign country for attention, but to repeat, this was a big-time party and state secret. By 1978, it had already become fairly clear that V. H. Courtenay, surprisingly enough, was sympathetic to the socialists in PUP leadership. These socialist PUP leaders were Assad Shoman and Said Musa, who were only Senators, not elected area representatives, but whose influence was surging in younger PUP circles. I remember that at the post-mortem held at Musa’s Princess Margaret Drive home following the PUP’s Belize City Council election defeat of December 1977, Mr. Courtenay’s was a prominent face. The December 1977 CitCo defeat of the PUP’s “Dynamic Nine” slate at the time was seen as a defeat for the PUP’s socialist wing. I think Mr. Rogers chose Mrs. Myrtle Palacio to replace him as the PUP’s Mesopotamia candidate in the 1984 general election. The election was a disaster for her, and I have to believe that Mr. Rogers had not done much to prepare any post-himself PUP leadership in Mesop. Even though the momentum was heavily UDP in 1984, Mrs. Palacio should have been able to do better than she did. In closing, we should remind younger readers that Collet, before 1984, included most of what we now know as the Lake Independence, Collet, and Queen’s Square electoral divisions. In early 1984, Dean Barrow won a UDP convention to choose a standard bearer for the old Collet constituency. When Collet was split into Lake I, Collet and Queen’s Square before the December 1984 generals, Mr. Barrow, given the UDP’s first choice and on the sound advice of Michael Finnegan, took Queen’s Square. Hubert Elrington, who had been defeated by Mr. Barrow in the aforementioned UDP Collet convention, chose Lake I, and Collet was left for Mr. Frank Lizama. The PUP figured Lake and Collet would be blue divisions, but the UDP won all three in the historic 1984 general election.